I had previously published this article in our patient newsletter Aches & Joints. If you are a runner, you probably worried about Plantar Fasciitis. Early in the summer when researching this article, I got a mild case of heel pain that left me distraught. My training for the Boston Half Marathon (Oct 7th 2007) was guarded and I am still tentative with my heel. But doing all the exercises linked at the end, I am good to go. Heel pain with the first steps getting out of bed in the morning, or when standing from a seated position, are the most characteristic symptoms of plantar fasciitis (fashee-eye-tiss). Pain can also occur with prolonged standing and walking. The sharp pain is usually on the bottom inside part of the heel. While it most often occurs in only one foot, it can affect both feet. The plantar fascia is a tough, fibrous tissue band running under the soles of your feet, and connects the heel bone (calcaneus) to the base of the toes. It also helps support the arch of the foot in its role as a shock absorber. An injury or continuous irritation of this tissue causes plantar fasciitis and the resulting heel pain. 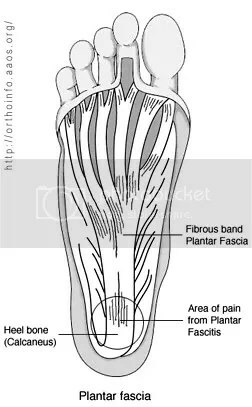 Multiple factors likely cause plantar fasciitis. It tends to affect people between 40 and 70 years of age, more likely in women, people who are overweight, or have jobs that require a lot of walking or standing on hard surfaces. Runners may be at a higher risk. People with flat feet or high arches are also more prone to plantar fasciitis. The following self care measures may help reduce symptoms. Stop all impact sports and rest the foot. Use shoes with better heel cushioning, or include a heel cup for pain relief. Apply ice to the heel. Freeze a plastic bottle of water and roll your foot over it. Limited use of nonsteroidal anti-inflammatory medications (e.g. ibuprofen or naproxen) is helpful. Different types of day or night wear splints keep your plantar fascia stretched, and relieve pain. Day wear splints can be worn with regular shoes. They keep the heel stretched and provide pain relief throughout the day. A night splint worn to bed keeps the plantar fascia stretched while sleeping and can prevent early morning heel pain. In the vast majority, plantar fasciitis will resolve itself within three to six months, but in some patients it can take a year or more. When symptoms fail to improve after 4 to 6 weeks of home treatment, see your doctor or foot specialist. If heel pain is accompanied by unusual symptoms such as back pain, burning in the foot, or recent trauma, see a specialist. In case of severe and persistent pain that has not responded to conservative treatments, your doctor may prescribe a removable walking cast. This will keep your foot immobile for a few weeks, to allow it to rest and heal. Other treatments include ultrasound therapy directed at the area of heel pain, or even cortisone injections. Only a tiny percentage of people undergo surgery, which includes detaching the plantar fascia from the heel bone. “Surgery should be the last resort when all other treatments have failed, and the pain remains severe for over a year,” insists Dr. Richard de Asla, Co-Director of the Foot and Ankle Service at the Massachusetts General Hospital and Instructor of Orthopaedic Surgery at Harvard Medical School, Boston, MA. “We rarely operate on this condition because in most patients the pain resolves on its own with time. Furthermore, the surgical success rate is only about 70% with the potential for other complications,” reminds Dr. de Asla. where can i get a day wear splints? please guide. I am suffering with heal pain in right side leg. Even after consulting doctor ( TIRUPATHI – AP) twice got injection and taking medicines for last three months, not reduced my heal pain. After getting injection I get relief for one week and after that same pain continues. I am basically Mining Engineer,My job required walking and climbing hilly terrains.I am sort of doubt in operation and post operation fitness. Please suggest good medicines and physio therapy hints. Stop the injections. Just follow the various stretching exercises provided here and win the related articles. Best is to keep your heel on a bag of frozen peas or other ice pack. And stretch and use comfortable shoes. Thanks for your response and advise. I was going through similar kind of pain for almost 2 years don’t multiple treatments but diet not cured . Than I came across hijama therapy through one of my friend. Done this treatment only once and it was cured forever . Please try this .it’s a old therapy. Thanks for your response and advise. Please let me know where I can get this treatment. You can Google it for your area.treatment name is is Hijama. Heel pain is the worst! It’s one of those things that if your feet hurt, your whole body hurts! This is a really interesting treatment option. I love how many choices you have though when it comes to treating it. I’m jyoti from odisha.l’m suffering Very worst pain in my heel till 1year.which specialist doctor good for the treatment? Please try and find a good physiotherapist who can help you with the heel pain. Also, please see the different stretches which are described here and in my links and if you follow these then those can help you as well. I am on my feet for about 16 hours a day, at first I had no trouble doing it. As the years go on my feet seem to be less and less happy with me, regardless of the type of shoes I wear. I now know how important it is to take care of your feet. I never thought about stretches for your feet, I’ll start there. Thanks for the share. I am from bangalore, I got heel pain for both legs due to running on hard surfaces.which I was not facing earlier. I went to doctor , he prescribed me tendocare tablets, which doesn’t give any result. he prescribed me wax Therapy and hot water Therapy. I took wax Therapy some what OK. I am feeling very uncomfortable without walking . I am using MCR cheppals at home and Silicon insole in shoes. please suggest me some good approach to recover my problem. kindly advise. Heel pain can be very painful and not easy to treat quickly. I recommend you stay away from all exotic treatments, injections etc. You are doing the right thing – wear comfortable, cushiony shoes, and even chapels for inside the home. You need to follow all the different stretches that are listed on these pages. Do them early in the morning, so you are stretching the fascia. Start slow and try and massage the heel and under part of the foot. if you get a chance at work while you are sitting, place your foot on an ice pack for 20-30 minutes. Continue to stretch as possible during the day. Ice at night, and when you go to bed, try and keep your foot straight up and done, and not flopping down (away from you). Easiest is to sleep with your feet straight agains the wall or backboard of your bed. Thanks your prompt reply. I will follow your suggestions . I am living in Singapore. I have PF from last 2 years. First my left leg started paining , after trying all treatment doctor suggest me for steroid injection. I thought I was totally cured from PF but my right feet started paining. Its now over year I am facing pain, so will take injection again. I want to ask you that is there any side effects of this injections. I take all care of feets, do yoga n stretching exercise daily, use dr.scholl chappals always, dont walk bare feet on floor. I would recommend against injections, unless you are debilitated. In my articles there are a variety of stretching exercises, and you should be doing these every day, better at the start of the day. Just wear comfortable shoes (not necessarily scholls), and barefoot walking on soft surfaces at home is actually very good. When you are sitting at a desk, it helps to place your feet on an icepack for 15 minutes; a frozen bottle of water can be used to roll your feet on it, while sitting, and gives immense relief. Start every day with stretching and end it with icing!